Very Good. 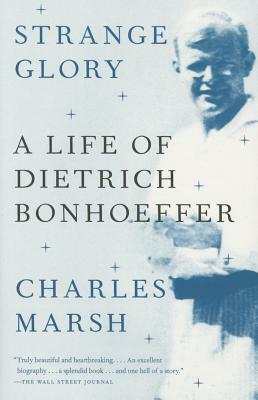 Strange Glory: A Life of Dietrich Bonhoeffer by Marsh, Charles, 2014-04-01. Glued binding. Paper over boards. With dust jacket. Contains: Illustrations, black & white. Very Good. This biography offers a portrait of the great Christian thinker and martyr, drawing on writings only recently made accessible-including the correspondence between Bonhoeffer and his teen-age fiance, Maria von Wedemeyer. 512 p. 43 photographs. New. This biography offers a portrait of the great Christian thinker and martyr, drawing on writings only recently made accessible-including the correspondence between Bonhoeffer and his teen-age fiance, Maria von Wedemeyer. Num Pages: 512 pages, 43 photographs. BIC Classification: BGX; HRCM. Category: (G) General (US: Trade). Dimension: 233 x 157 x 39. Weight in Grams: 826. 2014. Paperback.....We ship daily from our Bookshop. New. 512 p. 43 photographs.